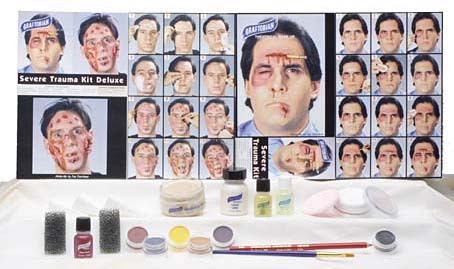 Our deluxe severe trauma kit provides you with makeup to create trauma and injury effects including bruises, scrapes, cuts, blisters, contusions, warts and pus-filled pockets. Compare with our standard severe trauma kit. Comes with complete instructions. No international shipping. In our Deluxe Trauma Kit, you’ll get an additional make-up color, face powder, spirit gum remover, 3 sponge wedge applicators, stipple sponge, a red lining pencil and black tooth wax.